Theres no question about it; laminate floors are becoming more popular than their look-alike counterparts, hardwood flooring like oak, maple, and pecan. They are also grabbing market share from natural stone (marble, slate, limestone, granite, etc.) and green, renewable building materials like bamboo. In the time since then Ive received a lot of good questions from readers via email so it seemed appropriate to compile this FAQ. This is just part 1, so if you have a question not covered here, email me here at admin@icanfixupmyhome.com. Ill send you an answer and include it in the next page of the FAQ. Check the laminate FAQ, page 2. Q. Do you install the first run of planks in the middle of the room? A. Its usually easier to start along the longest wall. Place the spacers along the wall and begin to lay your boards. Theres no need to start in the middle as you would if you were laying ceramic tile. Q. I had some kitchen damage and need to replace the cabinets AND flooring. Which do we do first, lay new laminate floor or install the cabinets? And is this a no experience necessary kind of job that we can do ourselves? A. I always install the cabinets first and then install the flooring, especially in a kitchen remodel. Why? Because water accidents can damage laminate flooring. It just makes it easier to replace sections. Finally, I cut and install baseboard. I dont see any problem doing it yourself. We all have to start somewhere. Q. What is the best approach? To lay the flooring planks the long way in the room, or the short way? My room is 11 4 X 15 2. A. Usually, shorter runs of laminate boards are easier to work with and snug up. But your room is close enough to the same that it wouldnt make much difference either way. Just consider this; the room will tend to look longer in the direction that the planks are running. So you can emphasize the size of the room; kind of like opening it up with a lighter shade of paint. Q. Do I need to add plywood to a concrete floor before putting down this kind of floating floor? A. No, you don't need to put down plywood over a concrete slab before installing laminate. Just be sure your slab is level; chip off high spots and float low spots with a self-leveling compound. Next goes your underlayment. Be sure the vapor barrier side (slick and shiny) is up and seal the seams with wide, clear plastic tape. Q. My contractor is adamant about putting base board on before putting down the floor with the baseboard raised! Is this really a good idea? A. Absolutely not! Even with the base raised, he can slip the board under the first wall, but then he won't be able to get the spacers out. On the other side, there's no way to get it under due to the way it snaps together. And the same issue on the perpendicular walls. The whole reason for base is as a trim to cover up the rough edges where the floor meets the wall. Tell him to lay the floor and then install the base. Remember, you have the checkbook; insist on a professional job. If he balks, find a professional through Angies List. Q. Would it work to install flooring over old vinyl flooring? This floor has radiant electric heat underneath, although it is no longer used (but still works). I was hoping not to have to remove the vinyl floor to get to the concrete slab. A. As long as the vinyl is in decent condition you can install on top of it. I personally prefer not to do it because I like to remain as close to grade as I can. The underlayment plus the laminate planks themselves add thickness, so you can run into unexpected problems, like doors dragging across the finished floor. Just check all details before you start. I would advise you to disconnect the radiant floor heating system as well, just to be on the safe side. At least make sure it doesn't void your warrantee. Q. I'm installing laminate flooring in my living room and dining room. My problem is that my kitchen is about 1/2" taller. How do I transition the flooring? A. Your building material store should be able to provide you with a trim piece called a "reducer strip". It's usually used to transition to a lower surface, but just turn it around and use it that way. Q. Which way do you roll out underlayment pad? Same direction as the floor or opposite? A. The underlayment can be rolled out in any direction that's the most convenient for you. It's just important that the vapor barrier side is up (if that's the kind you're using) and that you seal the seams with wide plastic tape. Q. I'm going to put a snap together wood floor in my dining room and think I understand most things but I have a "step down" living room and there's a 6" x 1" x 7' "step" (wood) between the dining room and the living room. It sticks up about an inch. 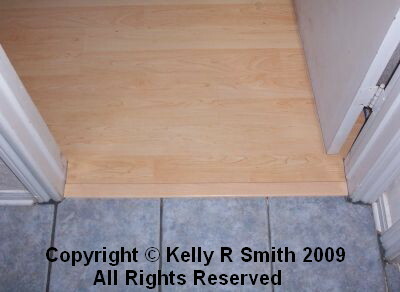 If the laminate has to be 1/4" from room edges do I really have a 1/4" gap between the step board and the flooring? Or some sort of "T" piece of trim to span the gap? Seems to be limited and somewhat clunky solutions to what I would think is a common situation? Any suggestions? A. There are a variety of trim pieces available to make a good looking finish in these types of situations. In your case, a "stair nose", "T-molding", or "end cap" might work well. Your flooring outlet store can get trim for you to match your laminate. If they don't have it in stock, have them order it for you.